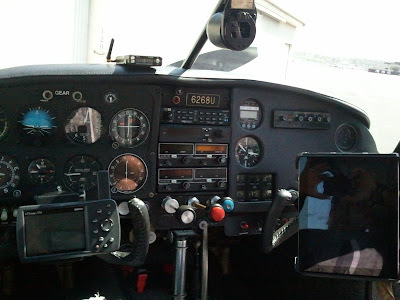 How to Upgrade Avionics For Less than $2k Using the Yoke! Nothing beats situational awareness via a moving Nav chart combined with GPS. This is my ’62 M20C. Garmin 296 on left (about $600 on eBay) and Ipad on right, (about $900). Plus, don’t forget, with the 296, you get a back up 6-pack. Also, flight planning is cut to seconds with ForeFlight. This is the easiest way to upgrade your birds avionics. Get in-flight weather with Stratus receiver for $799, which is optional. Currently, I still call in for weather briefings from Flight Watch (free).